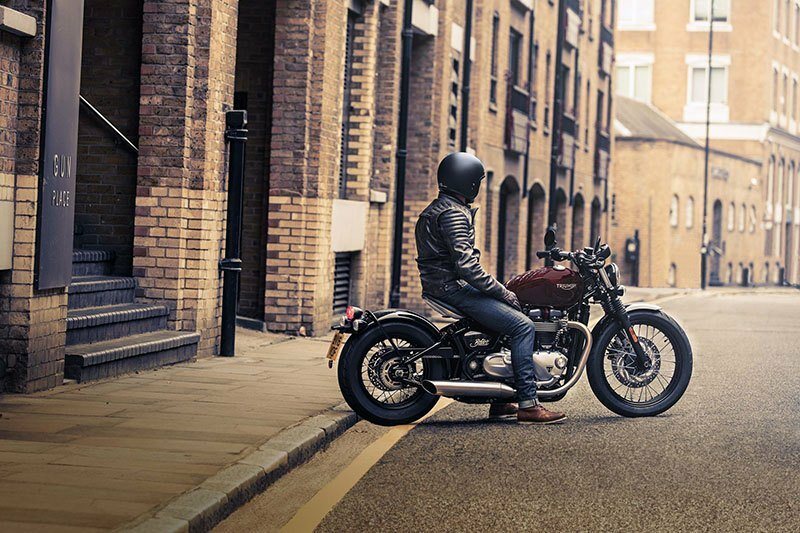 A genuine modern classic motorcycle, the Bonneville Bobber perfectly encapsulates the distinctive styling principles, muscular stance, and purposeful engineering attitude of a true British icon. Perfectly integrating all the hallmark features of a bobber with beautiful detailing, premium finishes and that iconic silhouette. 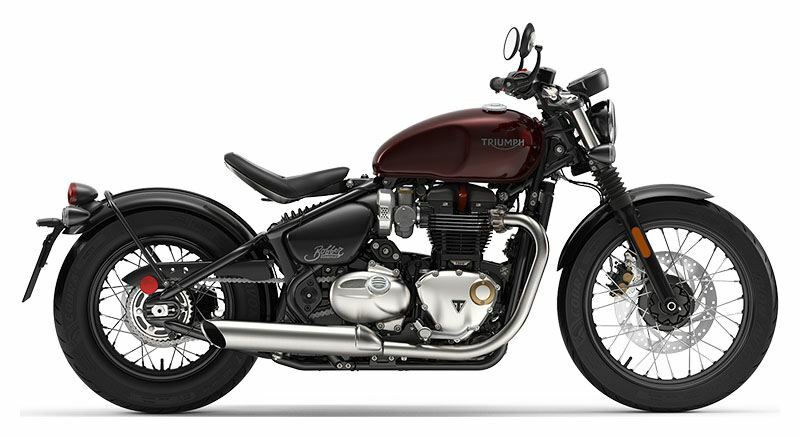 Adding to the stylish look are Bobber-unique bar end mirrors, handlebar risers, gloss black bullet indicators, branded locking fuel cap, and classically-styled twin throttle bodies for minimalistic, stripped back styling, muscular stance and purposeful presence. 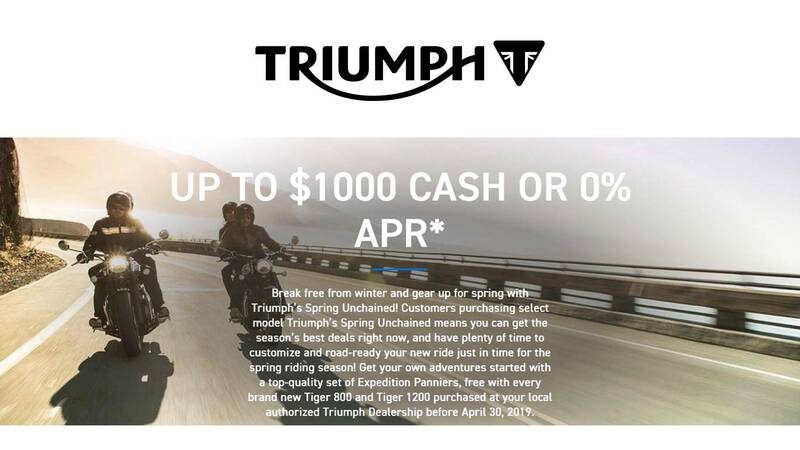 This stunning thoroughbred custom classic is the fastest-selling motorcycle in Triumph’s history. The Bobber enjoys peerless authenticity because it’s a genuine factory custom, iconic and authentic, with beautifully styled minimalism, unparalleled heritage, attitude and desirability for an addictive ride that, once it has you, will never let you go. BAR END MIRRORS: Stylish black bar end mirrors with forged arms and brushed mirror centre compliment the Bobber's unique looks. NEW HANDLEBAR RISERS: Beautiful satin silver and graphite handlebar risers add to the Bobber's distinctive and comfortable riding position. GLOSS BLACK BULLET INDICATORS: Black bullet LED indicators compliment the Bobber’s minimalist style. BRANDED LOCKING FUEL CAP: The branded locking chrome fuel cap compliments the bike's sculpted tank and adds to the overall premium finish. CLASSICALLY STYLED TWIN THROTTLE BODIES: The classical styling detail of the twin throttle bodies house the latest fuel injection technology. FIRST-IN-CLASS ADJUSTABLE RIDING POSITION: The Bonneville Bobber has a first-in-class adjustable riding position that can be tailored to suit the size and riding style of the rider. The innovative aluminium seat pan can move up, down, forwards and backwards allowing you to tailor the seat position for a dynamic ‘up and forward’ ride, or a ‘down and back’ more traditional Bobber stance. As well as the seat, the clock position can be tailored too with a simple quick-release mechanism that allows you to change the angle to suit your riding position. FLOATING ALUMINIUM SINGLE SEAT PAN: The Bonneville Bobber has a beautiful, distinctive, floating aluminium single seat pan with cantilever support arm. The seat profile has been ergonomically optimised and sculpted for comfort with a beautifully stitched deep foam pad, finished with premium Triumph branding detail. SWING CAGE AND SUSPENSION: There is a sublime black powder coated ‘cage’ swinging arm that brings the distinctive Bobber ‘hard-tail’ look, fitted with paddock stand bobbin mounts. The hidden monoshock rear suspension set-up under the floating seat, has been designed to deliver superior suspension performance and comfort. HIDDEN TECHNOLOGY: Fundamental to the Bonneville Bobber’s stunning looks is the elegant way that key components have been sensitively incorporated and hidden from view, so as not to compromise the clean lines or visual impact. Along with hiding away key technology like the ECU, ABS modulator and immobiliser, the signature Bonnie straight-line exhaust pipe run has a hidden cat box. SLASH-CUT EXHAUST - HOT ROD SOUND: Thrilling slash-cut brushed stainless steel twin sawn-off ‘peashooter’ style silencers deliver a pure Bonneville hot rod sound that envelops its rider. 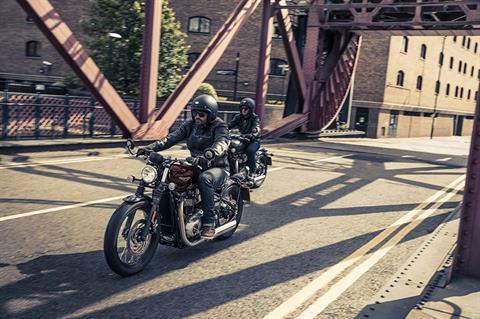 CATEGORY DEFINING CAPABILITY, CONTROL AND COMFORT: The Bonneville Bobber is built on an all new frame, chassis and suspension set up, with class defining dynamics and characterful commanding ergonomics. The new bespoke frame has been designed to suit the unique geometry and minimal tail end shape of the Bobber, with new front forks and bespoke damping. The first-in-class adjustable riding position and low seat height make the Bobber easily accessible and suitable for different size riders and riding styles. WHEELS AND TYRES: Classic wire-spoke wheels, big rear wheel set-up and stylish black rims give the bike its signature bobber look and feel. The Bonneville Bobber is fitted with Avon Cobra tyres that have been developed specifically for the bike - 19 x 2.5 in. on the front and a wider 16 x 3.5 in. on the rear for improved high-speed manoeuvrability with class leading stability. AUTHENTIC BATTERY BOX: The Bonneville Bobber’s stunning features include an authentic battery box with a stainless steel strap. CLASSIC REAR ‘DRUM BRAKE’ INSPIRED HUB: For an authentic classic look the Bobber comes with a unique ‘drum brake’ inspired rear wheel hub. REAR MUDGUARD LOOP: A signature feature of the iconic Bonneville classics.IGNITION BARREL: The ignition barrel has been positioned in front of the right hand side panel, in keeping with the heritage of a genuine bobber. IGNITION BARREL: The ignition barrel has been positioned in front of the right hand side panel, in keeping with the heritage of a genuine bobber.IGNITION BARREL: The ignition barrel has been positioned in front of the right hand side panel, in keeping with the heritage of a genuine bobber. RIDE-BY-WIRE: The latest generation ride-by-wire system brings a new level of control to the Bonneville Bobber, with minimal visual impact. FEATURE PACKED SINGLE CLOCK: The new Bobber has a stylish feature-packed single clock with a beautiful machined dial face, neatly housing a digital menu system, accessed by a handlebar mounted scroll button. Key features include: gear position indicator, odometer, rev counter, two trip settings, service indicator, range to empty, fuel level, average and current MPG, clock plus access to turn off traction control features. LIQUID COOLING: The modern liquid cooling system provides more clean fuel efficient riding, better fuel economy and a high first major service interval of 10,000 miles. 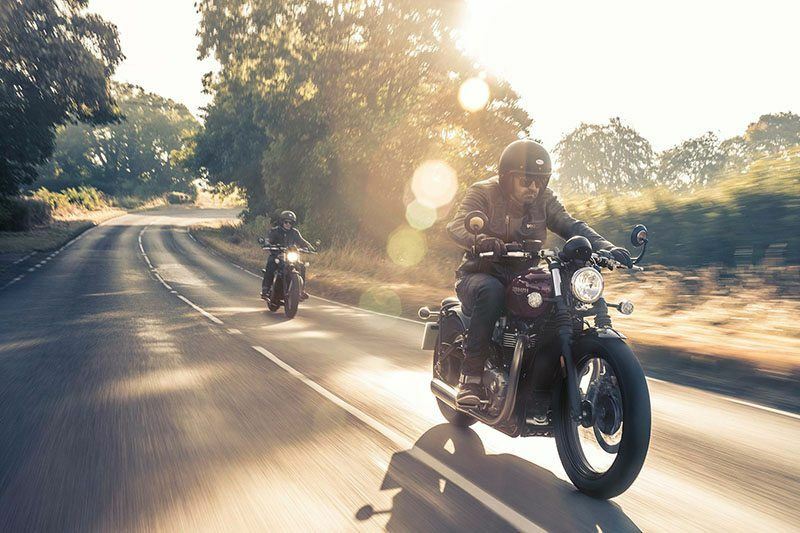 RIDING MODES: Linked to the ride-by-wire system the Bobber has two selectable riding modes - ‘road’ and ‘rain’ for greater control and safety. The two dedicated throttle maps can be selected via the handlebar mounted switch gear. SWITCHABLE TRACTION CONTROL: The new Bobber incorporates a switchable traction control system that optimises the delivery of torque when traction is compromised to maximise rider safety and control. TORQUE-ASSIST CLUTCH: The torque-assist clutch system brings a light touch and feel to the clutch control of the Bobber, helping reduce clutch lever effort for the rider, making it easier to ride for longer. The system also reduces the clutch packaging, allowing for a slimmer engine profile. LED REAR LIGHT, INDICATORS & NUMBER PLATE LIGHT: The LED rear light, indicators and number plate light have each been sensitively incorporated in keeping with the Bobber’s minimalistic look and provide a distinctive light pattern and greater power efficiency for long term durability. 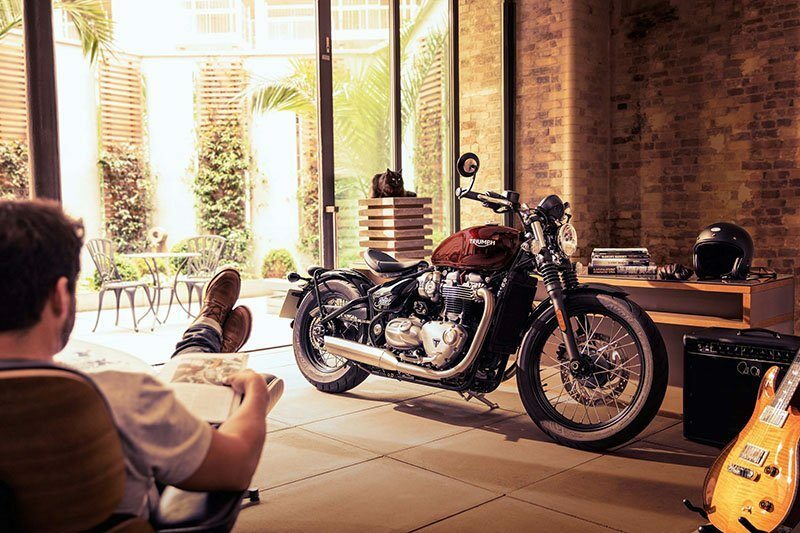 ENGINE IMMOBILISER: The Bonneville Bobber features a Thatcham approved security device that integrates a transponder into the new Bobber key, linked to a receiver in the ignition system, to prevent the engine from running without the correct key present. 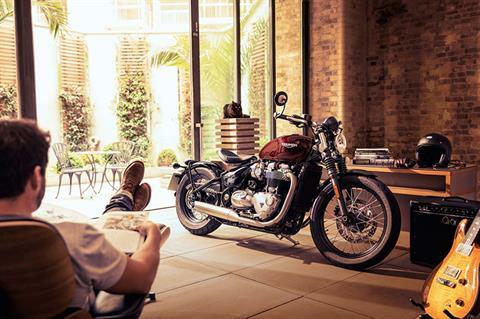 PEERLESS AUTHENTICY – BEAUTIFULLY STYLED: The Bonneville Bobber has absolutely peerless authenticity. A genuine Bonneville, the bike is truly iconic with unparalleled heritage, attitude and desirability – beautifully styled with hot rod minimalism. Stripped back to reveal its bare essence, the Bobber has been distilled from the iconic T120, sharing the Bonneville engineering and design DNA, but with its own unique, lower, more muscular and minimalist stance and a more purposeful and distinctive presence. HALLMARK FEATURES OF A GENUINE BOBBER: The Bonneville Bobber comes complete with all the hallmark features of a classic stripped back custom ride. Clean lines, low single seat pan with hard tail look, wide flat bars, sculpted fuel tank, narrow front and wide rear wire spoked wheels, minimal headlight and steel mudguards with centre ridge, all complement the sleek bodywork and add to its distinctive look. PREMIUM FINISHES: The Bonneville Bobber has many premium finishes including special bronze Bonneville 1200HT engine badge, premium tank badges and the signature Triumph makers mark triangle. Polished embellishments, brushed engine covers, machined detailing to instruments, silver satin and graphite handlebar risers, all comes together to create a stunning look that’s totally authentic and utterly unique. BONNEVILLE 1200HT ENGINE BOBBER TUNE: The category-leading, high-torque (HT) Bonneville 1200cc engine has a dedicated Bobber tune, delivering even more torque and power low down than the Bonneville T120. Specifically for the Bobber to maximize the riding character with a twin airbox and twin filter set-up, unique intake and exhaust system and output shaft. A ride-by-wire system has also been incorporated for enhanced throttle control, with 2 riding modes and liquid cooling sensitively incorporated for greater fuel efficiency.The Bonneville Bobber has an extended service interval of 10,000 miles (16,000 km) contributing to a reduced cost of ownership. Front - 32-spoke, 19 x 2.5 in. Rear - 32-spoke, 16 x 3.5 in. Brushed stainless steel 2 into 2 twin-skin exhaust system with brushed stainless silencers. LCD multi-functional instrument pack with analogue speedometer, odometer, gear position indicator, fuel gauge, range to empty indication, service indicator, clock, 2x trip, average & current fuel consumption display, traction control status display, Cruise control & heated grip ready - controlled by a handlebar mounted scroll button.